Salt Spring's Marcia Jansen (on right) tackles a hill in the 12-kilometre race at Cedar. The Old Boys were not the only local athletic team to be put off by the snowmageddon. The snow weeks resulted in the postponement of the third race of the Winter Island Race Series, disrupting a schedule that gave road runners two weeks to recover between races as well as making Salt Spring roads impossible or dangerous to train on. Runners got a month break from racing but then suffered from having to run three challenging races in a row with less than optimal recovery time. Runners travelling to the infamous Hatley Castle 8K in Colwood on Feb. 24 began to wonder if there would be another cancellation as they passed through rain, snow, sleet and blustery winds, but as happened the year before, actual race time was sunny if not a little windy at 4 C. As has become usual, Pat Peron led the Sneakers to the finish line over the 282 feet of climbing, his time of 36:42 being a second slower than his 2018 time, earned him 85th place overall out of the 356 who finished, sixth place of the 21 men in his men’s 60-64 age group, and 69th of 172 men. Lise Fraser was back to her winning ways with another first place in her age group of 21; 36th of 184 women and 117th of 356 overall. Her time of 38:36 was nine seconds better than her last race here two years ago. Sneakers newbie Duncan Elsey was the third Sneaker to finish his first run at the Hatley hills in 40:56 gun time for 159th place. This earned him a seventh place ribbon of the 14 in his 50-54 age group, and 102nd of all men. Sixteen seconds later, Eric Ellis crossed the finish line in 163rd place in a chip time of 41:12, first of 10 in his age group, 104th man. His time was 30 seconds faster than last year’s time. Doreen Peron finished 271st in a time of 49:21, eight seconds faster than the year before, 12th of 21 in her age group, and 125th woman. Seven days later, the Sneaker quartet of stalwarts gathered again at Cedar for a run at the new Cedar 12-km course. Time comparisons to last year’s running became moot as we discovered that the emergency course designed the morning of last year’s race when a truck ran into a utility course and closed half the course ended up being slightly short of 12 kms. As usual, Pat Peron was the first Sneaker across the finish line in a time of 54:21, earning him a 76th of 308, fourth of 18 in his M 60-64 age group and 61st of 152 men. Fraser finished in 57:34, earning her 105th overall, third of 26 in her 60-64 age group and 28th of 156 women. Ellis finished in 59:55 for 127th overall, second by seven seconds of 11 in his age group and 92nd of all men. And the fourth stalwart was Doreen Peron in her first run at Cedar, finishing in 1:12:25, earning her 234th place, 16th of 26 in her age group and 110th of 156 women. Marcia Jansen and Marion Young decided to add Cedar to the preparations for the June Ironman triathlon. Jansen came out of a two-year absence from road racing to finish the course in 55:15 for 82nd place overall, first of 13 in her 45-49 age group and 18th of 156 women. Young finished in 1:01:22 for 143rd place, fourth of 26 in her 60-64 age group and 45th of 156 women. In her second race for the Sneakers, Melissa Klassen finished in 1:07:38 for 195th place, ninth in her age group and 79th of 156 women. 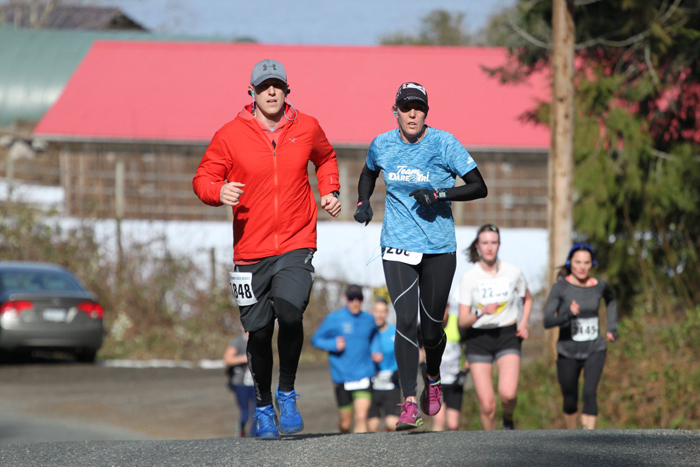 On the third weekend in a row, March 10, five Sneakers travelled to Port Alberni for the Paper Chase 15K. By this time, the quartet had shrivelled to a trio while Duncan Elsey returned from a week off with a cold, and Anna Ford returned from Central America to do what she called a long-slow practice run instead of a race. As usual, Pat Peron led the Sneakers with a time of 1:08:31 in his first try at this race. This earned him 38th place out of 225 running, fifth of 14 in his 60-64 age group, and 33 of 104 men. Ellis was the second of the trio to finish, his time of 1:15:32 being two minutes and 10 seconds faster than the previous year. This time earned him first by 14 seconds of ten in his men’s 70-74 age group, 53rd male and 104th overall. The third member of the trio, Doreen Peron, finished her first attempt at this course in 1:33:18, placing 11th of 21 women in the 60-64 age group, 78th of 121 women and 163rd overall. In his return to competition, his first run on this course and his fourth race of the season, Elsey finished in 1:15:10, which was 22 seconds ahead of Ellis, for another eighth overall of 12 in his 50-54 age group, 51st male and 73 overall. In her return to competition for her second race of the season, Ford’s alleged practice run in 1:27:33 earned her a 10th place of 21 in her 60-64 age group, 64th woman and 143 overall. Due to low attendance, the Sneakers have fallen to fourth place among the 41 small running teams, astounding considering its small number of participants; although its runners finish higher than many teams. The Paper Chase was the fifth of eight Island Race Series events. Those individual runners who finish at least five of the eight events qualify for the age-group race series awards. Those who finish more of five have their slowest races automatically deducted. Three Sneakers have qualified at this stage: Ellis at first in his age group, Pat Peron at sixth in his age group with up to four of the higher finishers likely not to complete the required five races, and Doreen Peron, 22nd in her age group with up to 10 of the lower rated runners in her group at risk of not qualifying. Actual standings are confirmed at the last race on April 14.